One of my favourite horror movies of all time. John Carpenters masterpiece is rightly regarded as a pioneering piece in the horror genre which blends science fiction and horror together seamlessly. The 'prequel' hit the theatres almost a year ago and is readily available to buy, so I am a little late with this review. The 'thing' is, I only watched the film for the first time a few days ago and decided to put my thoughts down here. So, can the prequel do justice to the original? Before we continue this page may contain spoilers, so if you have not seen this movie already you way want to stop reading. I will do my best to keep spoilers to an absolute minimum. 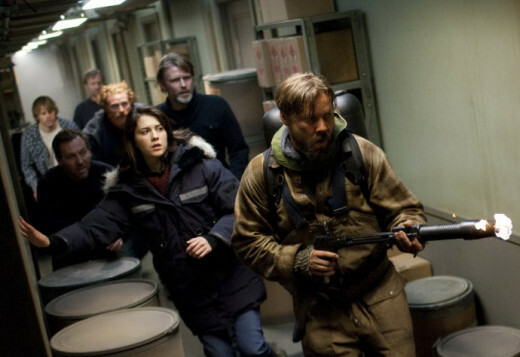 The whole premise of this film is based around the Norwegian Antarctic camp that we see in the Carpenter story when it is visited by helicopter pilot R.J. MacReady and Doctor Copper. It details how the Norwegian team find the alien craft and the alien itself (still buried in ice), how they bring it back to their base, and how it escapes and begins to wreak havoc. What we end up with is a film that almost fulfills two purposes; it is a prequel that also serves as a remake of sorts. Many of the scenes from the Carpenter film are re-created in the 2011 version. In a nod to the famous 'blood test' scene from Carpenters movie there is a similar sequence here (that is one of best scenes in the film) that uses another kind of test to determine who is human and who is not. I have to say that the makers paid a lot of attention to the 1982 movie by making the sets (both exterior and interior of the camp) match up very well indeed. The design of the Norwegian camp really captures the '1982 atmosphere' and the interiors are very reminiscent of the first film. 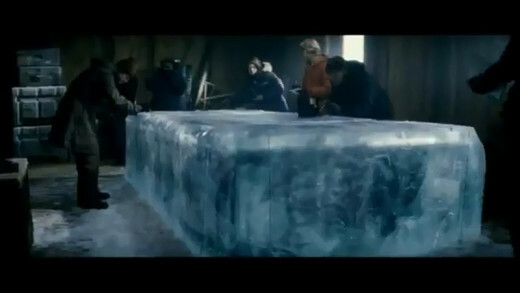 The huge ice-block that the alien was found buried in (which is discovered by MacReady and Doctor Copper) is recreated almost perfectly and is also placed in the 'same' store room that we know will be visited in a day or two's time by Kurt Russell and Richard Dysart. As the story unfolds the gradual and eventual wreckage of the camp is finished with all due respect to the first film. Eagle-eyed viewers will note subtle touches such as the 'fire axe' in the door which has even been included, a small detail that shows the vast efforts made to tie the two films together as closely as possible. The corridors, shacks, laboratory, radio room and recreation area all look convincing; even the equipment such as microscopes, test tubes, 8-bit computers and storage barrels keep in with the spirit of the 1982 film. This aspect of the film is very well done indeed. 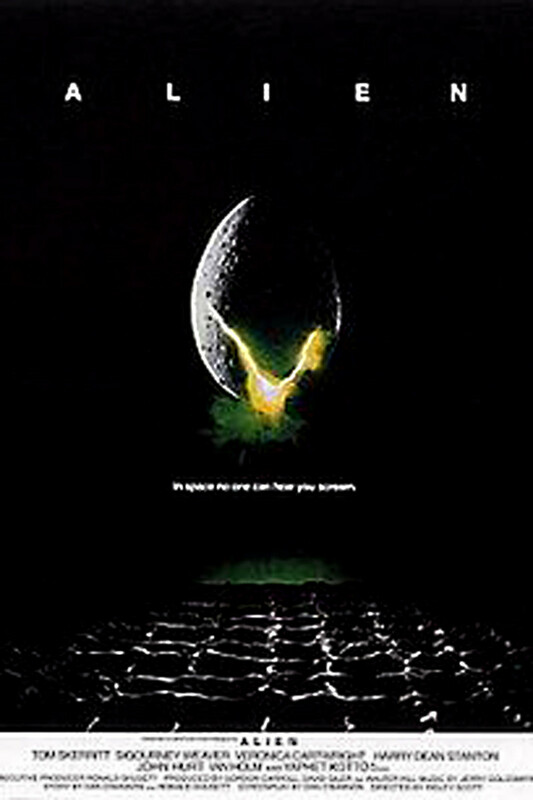 In my opinion this film has taken a lot of inspiration from another sci-fi horror masterpiece; Alien. The opening scene is very reminiscent of the three astronauts in Alien making their way to the derelict ship; here we have three guys in a snow-cat homing in on a 'signal' which turns out to be the crashed ship which was seen hurtling towards Earth in the 1982 film. Our main protagonist in this film (Kate Lloyd) is also very reminiscent of another iconic female lead (Ripley), which in itself is no bad thing, but here it just does not feel quite right. So, we have Kate as our lead who is ably backed up by helicopter pilot Sam Carter and lab assistant Adam Finch. You must remember that the setting for this film is the Norwegian camp ("They're not Swedish Mac, they're Norwegian") - and our main characters are American. It seems as though this was done to give the film more of a mass appeal, but I was disappointed as to me the 1982 film always made you wonder what happened to those poor Norwegian souls. I always envisioned the base being inhabited by Norwegian natives. For some reason in the Norwegian camp they also have an English radio operator (named Colin) which seems a little odd. Why would Norwegians hire an English person to be their main form of communication with the rest of the world? I'm pretty sure we never hear him speaking Norwegian either, although I may have to re-watch it to be sure. Anyway - the rest of the cast are Norwegian (and Danish) so we do garner a glimpse of life on the base from their perspective. For true realism I would have liked to have seen an all Norwegian cast complete with subtitles, but if I am being realistic then that would never have happened on a mainstream movie such as this. All in all though the cast do a solid job and all of them convey feelings of terror, confusion and mistrust convincingly. 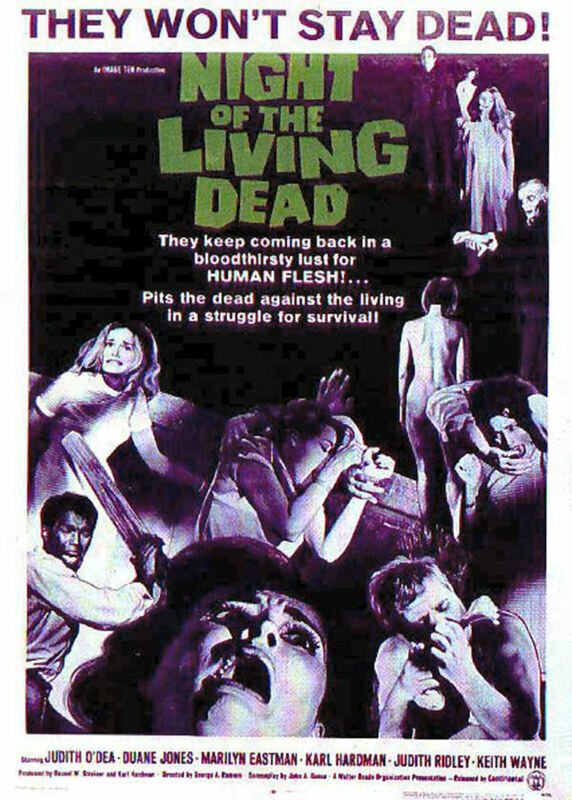 The first film is renowned for being tension packed, claustrophobic and full of atmosphere. An accolade which is well deserved. It is also widely famous for it's (for the time) ground-breaking special effects. Rob Bottin worked absolute wonders on Carpenters movie and the effects at the time were absolutely breathtaking. The Thing, in it's many forms, was scary, vicious and utterly disgusting. Many of the effects still look pretty good today and they are a testament to when the film was created. The slime, the filth and the horror of The Thing really made it something you did not want to come into contact with. Now I am not one of those people that hates computer generated imagery; in fact when it is well done it can be brilliant. But here is where the two movies are worlds apart. The CGI effects in this film are average at best. The first big 'reveal' of the monster comes as no surprise and it just does not look real enough to scare the viewer. The designs themselves are generally fine and a lot of imagination has gone into how The Thing looks, it is just that the implementation and interaction with the scenery and actors leaves a lot to be desired. To be fair the film did not have a huge budget to work with and there are worse examples of CGI out there. Perhaps less revealing of the creature and more movement in shadows and dark corners could have worked better. Less, could very well have been more. 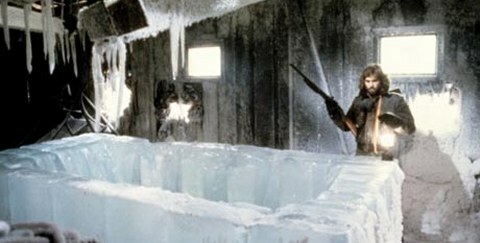 We know from Carpenters film that 'The Thing' is a very clever and calculating foe. It will study it's enemy, play them off each other with cunning tactics and attempt assimilation only when it feels the time is right. As MacReady fathomed, "It's vulnerable out in the open. Right now it wants to hide inside an imitation." Yet here it has been reduced to little more than a B-Movie monster that attacks far too much and also, (depending on who is being attacked) goes through a far too elaborate transformation before taking aggressive action. Gone is the stealthy and calculating 'Thing', here is the 'jump out and try to scare you Thing'. The big final showdown really reduces the intelligence level and abilities of the alien down a step too far and I was left thinking "That's just not the monster we all know". The very, very end of the film ties in with the opening of the Carpenter movie superbly, but after everything else that has happened it almost feels as though it has been tacked on for the sake of continuity. 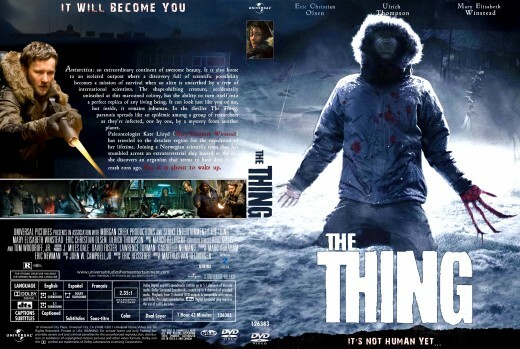 If only they had managed to get the behaviour of 'The Thing' to match up with the '82 film as well as they did with the sets, then this is a film that really could have been something. As it stands it is a solid enough horror movie that delivers a reasonable scare, and I feel that the makers of the movie really had their hearts in the right place. 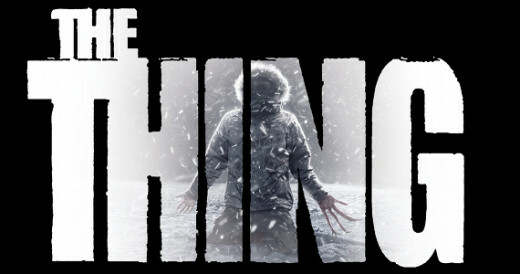 The Thing 2011. It's not human. Yet. All in all this is a good attempt to flesh out the back story of The Thing and despite a few misgivings is still well worth a watch. It will never, ever be held in the esteem that the Carpenter film is, but to be fair it is an enjoyable enough ride for any horror fan. The acting is fine, the sets are very well done, and it does generate some genuine atmospheric moments. The first 'autopsy' scene is extremely well shot for example. I watched this move with little expectation, and ended up enjoying it for what it is. Mary Elizabeth Winstead and her portrayal of kate is one of the main reasons I enjoyed the film. Even if it was inspired by Ellen Ripley. The movie also honors the mighty flame thrower, as the weapon of choice. In the way that the 1982 film did as well. At certain points during the movie, the "monster effects" seemed a little off to me. Too much CG maybe? It did help make sense of that opening sequence in the 1982 film. Thanks for the comments guys and for reading my article. 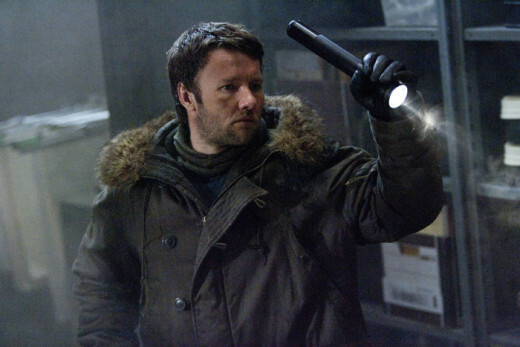 The Thing (2011) was a movie I had little hope for - so when I got around to watching it I was pleasantly surprised as it turned out to be better than I had expected. It was a good attempt to tie the two films together and with better (or less) CGI and more focus on the Norwegian team it could have been really great. I agree with you to a certain extent. After reading your article which I enjoyed reading, I think that "The Thing" was attacking so much in the prequel was that maybe it was just trying to figure out us humans and how we interacted. Like you stated, "The Thing" studies it's victims and assimilate when needed. Since 2011 film was a prequel to Carpenter's 1982 original, maybe it was just studying before it came to the American camp since it hid so well there. I do agree with you that having Americans in the Norwegian camp was to appeal to the masses since the film makers didn't want to have a whole film in subtitles if all the actors were Norwegian. I did like the film since I am a huge fan of the original and loved how the film makers really studied the original film to make sure that everything matches up when Macready and Dr. Copper try to figure out what happened to the Norwegian camp. I even liked how they showed what the body that Macready finds that looked like two people happened. That was pretty interesting. Great article. Voted up.